Controlled flooding of the Colorado River by releases from Glen Canyon Dam has been proposed as a way to manage sediment and other resources in the Grand Canyon. Floods are a natural occurrence of rivers and, in the case of the Colorado River, the architect of the Grand Canyon landscape. Scientists have proposed a controlled flood in response to resource managers' request for ways to restore some of the pre-dam resource conditions. Floods are expected to suspend sand moved to the river bottom by lower flows and deposit it along the river banks where it will be above water after the flood recedes. In this way, the limited sand resources can be utilized to preserve habitat for plants and animals and for use by river runners and campers. Because some effects of a clear water flood from Glen Canyon Dam are uncertain, the U.S. Geological Survey (USGS), in cooperation with the Bureau of Reclamation and the National Park Service, has planned a short period of controlled flooding to provide information for science-based decision-making. Glen Canyon Dam began to store water in 1963. The dam made possible the production of electricity and the irrigation of crops and created new opportunities for recreation. By many measures, life in the Southwest has been improved. But the presence of the dam and regulation of flow have greatly reduced the size and frequency of floods, the amount of sediment in the river, and the annual variation in water temperature. The river environment changed within Glen Canyon National Recreation Area, Grand Canyon National Park, and tribal lands of the Navajo, Havasupai, and Hualapai people--in other words, areas set aside for the preservation of the cultural and natural resources. Concern about the environmental effects of the dam and its operation caused the Bureau of Reclamation to initiate a series of studies known as the Glen Canyon Environmental Studies (GCES). Efforts by concerned parties resulted in the enactment into law of the Grand Canyon Protection Act of 1992 and the completion of an Environmental Impact Statement (EIS). The Act and the EIS provide for use of Glen Canyon Dam to manage the resources of the river corridor, including the use of periodic controlled flooding. 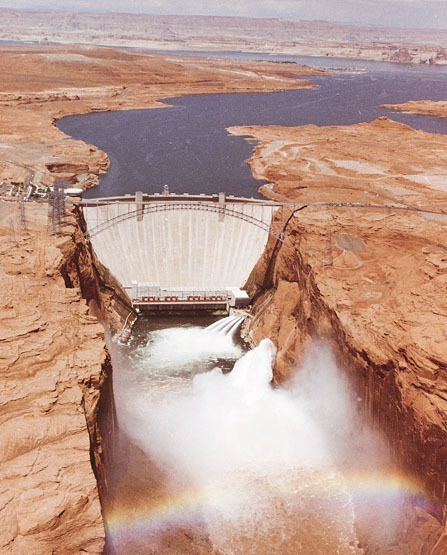 High-flow release from Glen Canyon Dam in 1984. (Click here for a higher resolution photo) (if your browser will handle jpeg images). Before 1963, melting snow in the upper Colorado River basin produced high flows that raced through the Grand Canyon each spring. An average peak discharge of 93,400 cubic feet per second (cfs) scoured large volumes of sediment from the river bottom. Later in the summer, receding floodwaters deposited this scoured sediment and also sediment carried in from tributaries. This annual scour and fill process maintained large sand bars along the river banks, kept sand bars clear of vegetation, and kept debris fans--deposits of cobbles and boulders that form at the mouths of tributaries--from constricting the river. Reduced frequency of flooding since flow regulation began has reduced the size of sand bars and allowed vegetation to encroach on the channel, debris fans to build up, and backwater areas used by native fish to fill in. The last decade of study has greatly expanded scientists' understanding of the Colorado River in Grand Canyon. 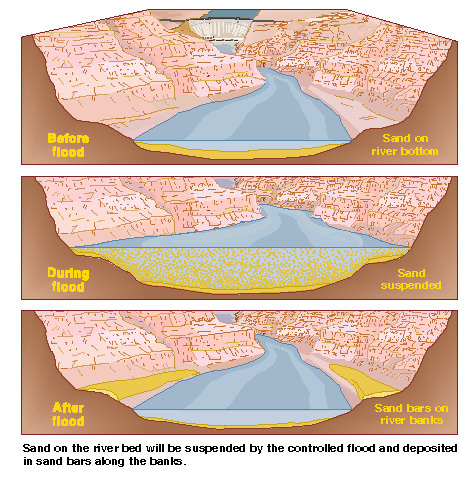 On the basis of this knowledge, scientists predict that periodic high flows can be used to retain sand in the canyon by depositing it along river banks. Sand submerged in the river is not stationary but is slowly being moved downstream along the river bottom. Floods have the hydraulic energy necessary to suspend sand and to form bars higher up the river banks. These sand bars are less subject to erosion and more useful for camping than bars formed by lower flows. Backwater areas will be scoured of accumulated fine sediments and vegetation. This cleaning or rejuvenation process will recreate low-velocity habitat for fish. Debris fans will be eroded and the character of the rapids changed. A controlled flood from Glen Canyon Dam is proposed to rebuild sand bars along the river banks and to provide data needed to predict the movement of water and sediment during floodflows. Methods for predicting the movement of water and sediment were developed and successfully applied by USGS and other scientists at lower discharges. Measurements at floodflows are needed to extend the usefulness of these methods. Once tested with data from a wide range of flow conditions, methods can be used to predict how flow and sediment would be affected by a wide range of dam releases. 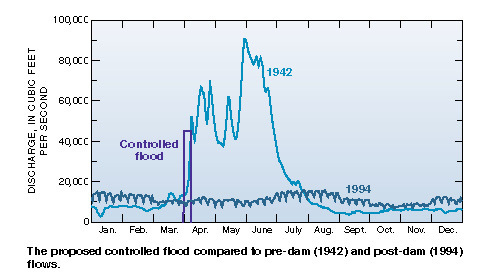 The proposed controlled flood compared to pre-dam (1942) and post-dam (1994) flows. (Click on image for a larger version, 66K). Discharge will be monitored at five main-stem and three tributary sites. The velocity of water as it travels down the river will be measured by the injection of dye and its timed arrival at known distances downstream. Velocity will allow estimation of basic river-channel characteristics needed to extend methods for predicting flow and sediment transport to include floodflows. River stage will be measured at about 40 sites. Stage data will be used to test methods of predicting the arrival time of the floodwave and to determine unmeasured tributary inflows. About 100 cross sections of the river channel will be measured before and after the controlled flood to determine the changes in sand storage. Selected cross sections will be measured during the flood to determine the rate of change. Suspended-sediment concentration and particle-size data will be collected at several main-stem sites. Several eddies will be intensively monitored to document the flow patterns and accumulation of sand. These data will help explain the critical role of eddies in trapping and storing sand along the river banks. Debris fans that have built up since the last flood in 1986 will be monitored for any changes caused by the controlled flood. Two fans will be monitored during the floodflows to determine the rate at which these changes occur. Sand on the river bed will be suspended by the controlled flood and deposited in sand bars along the banks. (Click on image for a larger version, 169K). Physical and chemical measurements of the water in Lake Powell will be made near the dam on a daily basis during the flood. These measurements will help define the zone in Lake Powell from which the controlled -flood water is drawn. Measurements of river water will be made just downstream from the dam before and after the controlled flood to document how the physical, chemical, and biological processes were affected.